Five Kontakt instruments – D, D untamed, C#, C# untamed, and bellows & bag noises. The uilleann pipes is the national bagpipe of Ireland. It is a complex instrument made up of several pipes, a pipe bag to hold the air, and a set of bellows used to inflate the bag. This library features two full sets of uilleann pipes each with chanter, drones, and regulators – including a rare double-bass regulator. The uilleann pipes are one of the harder traditional Irish instruments to play but now, through the wonderfulness of Kontakt, anyone can play them… yes even you! Our aim was to take the components of this complicated instrument and map them to the keyboard in a way that is easy for you to play and perform. Just like on the real instrument the drones of Dicky Deegan’s Uilleann Pipes sample library can be turned on or off using a single key switch for each pipe. These key switches are velocity sensitive which is great when working in a DAW as it prevents the switches being triggered incorrectly when you play back your sequence. You can read more about the way these key switches work in the user guide. The regulators are polyphonic for playing chords. For notes that are available on more than one regulator pipe you have the option to select which pipe’s samples are triggered, giving your performance an extra hit of realism. uilleann-pipes-slideThe chanter is monophonic. Playing in an overlapped style will trigger legato transitions and to compliment this further we’ve included a retrigger function which is ideal for trills. Using the slide controls you can perform formant correct slides of varying lengths and by adjusting the velocity of notes you can replicate the sound of performing the chanter on or off the knee. To help you create detailed mock-ups we’ve included an extra Kontakt instrument featuring a selection of bellows and bag noise samples. These are recordings of Dicky filling the pipe bag with air before and during his performance. These samples are of various lengths and intensities so that you can fit them into your sequences. One of the advantages of sample libraries is being able to do things that are impossible on the real instrument. uilleann-pipes-balanceWith Dicky Deegan’s Uilleann Pipes not only do you have control over the volume of the three microphone positions, you can also set the balance between the drones, regulators, and chanter. This is incredibly useful for adapting the instruments to different contexts or incorporating them into ensembles. 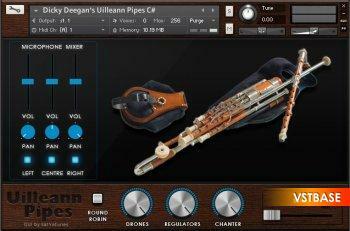 The Professional edition of Dicky Deegan’s Uilleann Pipes contains five Kontakt instruments, two in the key of D, two in C#, and the bellows and bag noise patch. One of the instruments in each key is a standard patch with smooth, elegantly edited samples waiting for you to create a performance. The other is a little more wild and untamed and captures more of the musician’s raw emotion. The Lite and Professional editions share all of the same features but the Lite edition contains only the standard D patch and the bellows and bag noise instrument. This is a great choice if you’re on a lower budget or don’t require the extra options of the C# chanter and the untamed patches. You can upgrade from the lite to the pro version at any time. Requirements: Kontakt 4.2 or higher (full version of Kontakt required, will not work in the free Kontakt Player), 1.5GB Disk Space.